Is cash or accrual accounting better for your business? The cash method and the accrual method (sometimes called cash basis and accrual basis) are the two principal methods of keeping track of a business's income and expenses. In most cases, you can choose which method to use. These methods differ only in the timing of when transactions, including sales and purchases, are credited or debited to your accounts. Under the cash method, income is not counted until cash (or a check) is actually received, and expenses are not counted until they are actually paid. The cash method is the more commonly used method of accounting in small business. Under the accrual method, transactions are counted when the order is made, the item is delivered, or the services occur, regardless of when the money for them (receivables) is actually received or paid. In other words, income is counted when the sale occurs, and expenses are counted when you receive the goods or services. You don't have to wait until you see the money, or actually pay money out of your checking account, to record a transaction. 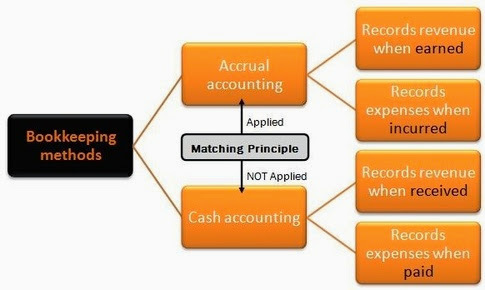 The accrual method applies the matching principle that requires a company to match expenses with related revenues in order to report a company's profitability during a specified time interval. Ideally, the matching is based on a cause and effect relationship: sales causes the cost of goods sold expense and the sales commissions expense. With the accrual method, sometimes it's not easy to know when the sale or purchase has occurred. The key date is the job completion date. Income recognition. You do not record the income in your books until you finish a service, or deliver all the goods a contract calls for. Expense recognition . Likewise, you don't record an item as an expense until the service is completed or all goods have been received and installed, if necessary. (If a job is mostly completed but will take another 30 days to add the finishing touches, technically it doesn't go on your books until the 30 days pass.). Accrued Revenue: Revenue is recognized before cash is received. Accrued Expense: Expense is recognized before cash is paid. Deferred Revenue: Revenue is recognized after cash is received. Deferred Expense: Expense is recognized after cash is paid. Most small businesses (with sales of less than $5 million per year) are free to adopt either accounting method. Your business stocks an inventory of items that you will sell to the public and your gross receipts are over $1 million per year. Inventory includes any merchandise you sell, as well as supplies that will physically become part of an item intended for sale. 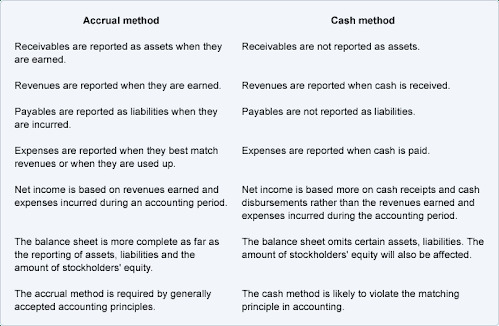 Advantages and disadvantages of the accrual method. While the accrual method shows the ebb and flow of business income and debts more accurately, it may leave you in the dark as to what cash reserves are available, which could result in a serious cash flow problem. For instance, your income ledger may show thousands of dollars in sales, while in reality your bank account is empty because your customers haven't paid you yet. Advantages and disadvantages of the cash method. And though the cash method provides a more accurate picture of how much actual cash your business has, it may offer a misleading picture of longer-term profitability. Under the cash method, for instance, your books may show one month to be spectacularly profitable, when actually sales have been slow and, by coincidence, a lot of credit customers paid their bills in that month. The most significant way your business is affected by the accounting method you choose involves the tax year in which income and particular expense items will be counted. For instance, if you incur expenses in the one tax year but don't pay them until the following tax year, you won't be able to claim deductions for them in the year you incur the expenses if you use the cash method. But you would be able to claim them that year if you use the accrual method, because under that system you record transactions when they occur, not when money actually changes hands. Once you have set up your accounting method, you must generally get IRS approval before you can change to another method.